This all purpose reclining chair is designed for larger individuals with a weight capacity up to 850 lbs. 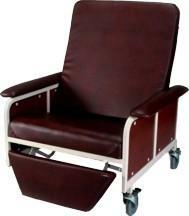 Care assistant can recline chair with the gas assist mechanism located on back of chair. Release bar also doubles as a push bar. Front casters swivel and lock. Rear casters lock, but do not swivel.